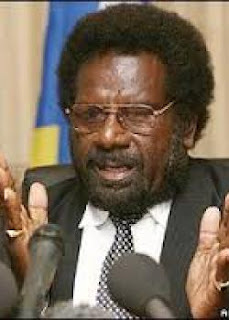 Solomon Islands Minister of Finance and Treasury Snyder Rini has unveiled the Government’s 2017 budget of SB$4.1 billion (US$256 million) in Parliament Monday, which, targets spending in social services, rural infrastructure and rural development activities in the new year. The 2017 Budget is geared towards providing both quality and coverage of public investment to people which demonstrates the DCC Government’s commitment to implementing its policies and mandate which articulates key policy directives that will improve the welfare and livelihood of Solomon Islanders. Rini said the DCC Government key objectives continue to remain focused on achieving broad-based economic development which recognises the value and potentials of the country’s population and their resolve to determine the course and outcomes of their own destiny in nation building. Launched on the theme ‘Building the nation’s resilience to enhance economic growth and service delivery’, the 2017 budget is the Government’s key vehicle for implementing policies that are in line with the country’s medium term objectives. “The Government will focus more intently on investing in infrastructure in the rural areas, particularly, roads, energy and the transport sectors and shipping services, to enable access and linkages to markets,” Minister Rini said. He added that the Government remains determined to ensure businesses and individuals both in rural and urban areas have access to reliable and cheaper sources of electricity by investing in the Tina Hydro project to ensure households have access to electricity services. Minister Rini also highlighted that the Government is committed to the right sizing of the Public Service with the 2017 budget to continue to improving performance across Government by finding new and innovative ways to use public resources to achieve more with limited resources. The Minister also cautioned that the outlook for the global economy remains volatile in financial markets with weak domestic demand in a number of major economies. Nonetheless, global growth for 2017 is forecasted to be modest at 3.4 percent which is below the average growth rate of the past decade.